Grosfillex’s Deco range of PVC garden summerhouses deliver the low maintenance solution in designing a secret escape sat a stroll away within a home-ground’s landscape providing a quick getaway to sidestep household’s busy surroundings. Potential usages regarding Deco sheds are vast. 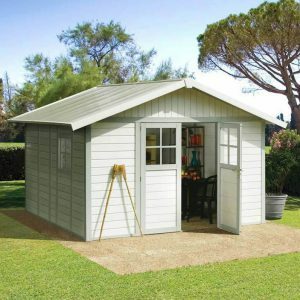 What’s your idea of a summerhouse or garden shed? Maybe a peaceful office to escape home-life’s noise, a quiet art studio, a fab games room for the kids, an exquisite poolside chalet, a man-cave’s haven for gaming, the most luxurious she-shed to chat away with friends, an enchanting hideaway you can both escape to at the bottom of the garden, the most desirable kitchen-diner sat within a BBQ deck or perhaps it’s simply the conventional charm a gardening or potting shed serves for. Read how Sylvie customised her Grosfillex shed into a kitchen diner situated next to her BBQ deck to create ease regarding outdoor dining when friends visit at party times. My passion regards sturdy weather-resistant resin compositions enabling the departure from yearly conservation duties relating to yearly re-coats of varnish to nurture the facade and re-roofing projects. Having these headaches replaced by the undemanding role of a swift wash down to rejuvenate the immaculate appearance provides time conscious advantages. Grosfillex sheds certainly fit this bill. Grosfillex are a French company designing and manufacturing various styles of PVC storage sheds and PVC summerhouses. Delivering robust constructions to survive adverse weather conditions, near zero-maintenance facades that a rapid clean accomplishes whist displaying the most exquisite of appearances relating to design and colour. 5 sheds complete Grosfillex’s 11 m² Garden Shed range, all summerhouses comprise of identical design, construction and manufacture, only their colour shades vary. Fulfilling Deco’s 11 m² range regards: Two sheds exhibiting pastel shades of white and grey/blue, the other white and grey/green whilst three sheds parade deeper tints: A radiant red/burgundy, mocha brown and dark grey complete the range. All five sheds are surrounded by white trims, their picturesque exhibits complement any landscape with pure finesse. Why choose a Grosfillex PVC style shed? Grosfillex provide the answer! Deco shed facades are manufactured with a PVC composition. Blending into the resin mix regards the facade’s colour pigments for display combined with UV toughening protection elements to withstand plastics inherent bleaching problem and surface-splitting when exposed to sunburn attacks. The resin sheets are molded into a 26 mm thick double walled PVC skin adjoined together by a ribbed reinforced structure whilst composed into a semblance of horizontal wood panelling across the facade and vertical panelling above the doors towards the apex peak front and back. Fine details of textured grain produced by a heliographic printing process deliver exquisite finishing touches to their design. The edging surrounding the facade panels is designed to slot into the grooves of the vertical metal struts during assembly whilst simultaneously adjoining the base trim and roof infrastructure up above. The panels are secured to the metal framework with screws delivering overall rigidity once the final construction’s completed. PVC is resistant to Autumn’s damp conditions, winters heavy snowfalls and summer’s heatwaves requiring no future conservation projects to maintain their resistance. Re-painting, re-varnishing and other time consuming maintenance jobs are eliminated with a PVC composition. Cleaning a Grosfillex shed either involves a light spray-hose down or a bucket of warm water, mellow detergent and scrubbed with a soft brush to remove stubborn garden stains, many take the effortless option instead and pressure wash them down once a year before summer season commences. Their near zero maintenance advantage epitomises the ease of modern-day living. Deco sheds manufacture is 99% recyclable delivering towards perfection regarding environmentally-friendly green credentials. An extravagant PVC roof structure with a generous angled pitch crowns Deco sheds of to stylish effect yet this provides many advantages in protective sheltered accommodation. Grosfillex’s extended roof-design dramatically overlaps the facade to prevent rainfall dripping in where the walls abut. A super high-pitch roof pays homage to an effective rainwater drainage system whilst generating an abundance of internal headroom height. Step inside a Deco shed, they’re unlike the usual quality plastic sheds reinforced with their steel truss system spanning the apex width whilst accommodating a skylight translucent strip embedded within the roof ridge. Deco sheds roof structure is like an upside down ‘V’ where the main roof support is the steel roof ridge to where all the roof’s metal framework secures to providing well bolstered reinforced support. Instead of a skylight, larger windows in the doors and facade deliver their daylight. Deco Sheds roof manufacture is a similar twinned reinforced PVC panel formation to which the walls possess albeit shaded with a different tint to the facade. Each roof panel secures to the metal roof struts just like the wall sheets fit to their vertical supports. The beauty regarding a PVC make-up to where roofs are concerned relates to their composition being unsusceptible to rot and decay providing long-term weather defence. Unlike roofing felt’s sudden disintegration problems when damp conditions attack their structure leading to frustrating re-roofing projects, a resin composition remains unaffected. Comparable to a standard quality resin shed, inside a Deco Summerhouse a spacious more homely environment front to back presents due to the advantages of their upside down ‘V’ roofing structure being absent from steel beams. A window in the wall and windows in both doors deliver an abundance of daylight to the interior. The window in the wall can be placed on either side at a position within the steel vertical struts represented by the facade’s white vertical trims shown in the images. Work out which side suits your location before assembly commences. Air vents are integrated at the top four corner positions of the shed generating a fresh current of air to circulate the interior eliminating condensation building up and dripping inside during warm weather whilst replacing a sweaty atmosphere with a fresh internal ambience. Deco sheds are deliberately designed without a built-in floor due to their diverse usage potential requiring to fit a floor dedicated for the services required. If for instance a garden or potting shed is desired, either wood decking or concrete will suffice. If a kitchen-diner or swimming pool chalet are intended then non-slip floor tiles provide the practical easy-clean solution. On the other hand however, maybe a home-office, games room, art studio, resting place or outdoor garden lounge is to be designed then wood flooring or stylish floor tiles with accents to match one’s fabrics and decor customises your style. Within the internal metal struts securing the wall sheets in place, specially designed wall mounting sections can be fit into their conformation allowing the ability to screw into the walls to install shelving, hooks and hang art work enabling customising the shed / summerhouse into the most homely of surroundings. Wall mounting kits are sold separately. All Grosfillex sheds and summerhouses comprise of traditional style handles and are key-lockable just like security operation a house door delivers. The importance in preparing the correct PVC shed foundations is essential to their construction, best not to side-step this ruling. 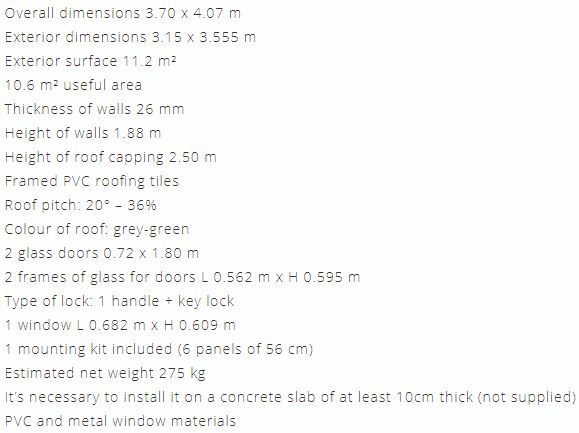 Grosfillex advise to prepare a solid substrate of concrete at least 10 cm thick, laid perfectly level and flat for these large 11 m² sheds. It’s common to increase the foundation area outside a summerhouse to accommodate seating and BBQ services etc, dependant on what desires the shed or summerhouse services are to be used for. Preparing the correct solid & level foundations are essential and well worth taking the time & effort in adhering to, in order to accomplish a flawless shed construction. This one-step procedure ensures a perpendicular stance eliminating leaning pressures to one side whilst a level base eases the plumb alignment of the wall panels and doors, making sure they both swing open and close correctly. Once the style of flooring is decided upon, the base trim runs around the perimeter of the shed’s floor expanse and secures down onto the solid foundations with anchor screws. Vertical wall struts secure into the base trim to which the facade sheets adjoin, followed by the roof framework. One the shed is constructed, waterproofing the shed regards applying sealant around the internal side of the base perimeter trim. Additional anchoring to further reinforce the construction’s anchorage system is by virtue of an anchoring kit delivering the shed with increased stability and wind resistance levels, specifically designed for exposed areas. Anchor kits are sometimes supplied with the order, check with the supplier prior to purchase. An anchor kit comprises of steel cables, clamps, tensioners and quick links. It fits inconspicuously within the corners of the shed, straightforward to assemble and strengthens the already in place anchorage system down onto the groundwork’s below. 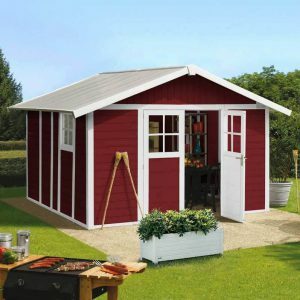 Constructing a Deco Shed does take time and requires 2 people to follow the order of steps within the instructions implementing the demonstrated procedure. A step ladder and room is necessary around all sides of the summerhouse to enable fitting the roof. Household tools build Grosfillex sheds. Grosfillex Deco Sheds exhibit ultra stylish designs to enhance any garden settings. Whether traditional shed services are required or customising a summerhouse into your own desired space to suit personal preferences and requirements providing an escape route of peacefulness a stroll away from home’s busy lifestyle. Weather-resistant facade, sturdy build quality, superb roof rainwater drainage system, attractive to the hilt, designed with a choice of colours to choose from whilst enclosed in such an easy to clean surface describes Deco’s outer-face. Inside a spacious room awaits for conversion into one’s own desires, a light and airy atmosphere is delivered by the windows and air vents, a key-lockable door provides security whist a 10 years limited warranty coupled with remarkable feedback provides their confidence. Thanks for reading about Grosfillex’s Deco range of PVC garden summerhouses. If you have any related summerhouse questions, please ask in the comment section below. Always happy to help. Hi, Simon. What a great idea for a shed that is maintenance free. When my kids were little, we built a wooden shed for a playhouse. Now, this would be so much easier and nicer. I love how you can choose different designs. The summerhouses are my favorite. Thanks for the great article. Thanks for visiting and reading about these Grosfillex 11 m² PVC garden summerhouses. All Grosfillex sheds are a polypropylene resin manufacture, 99% recyclable and resistant to rot and decay whilst retaining an easy to clean surface epitomising how advanced the new-age design structures have become to deliver the ease of modern day outdoor summer living. Yes, all these 11 m² Deco Summerhouses have identical structures, only their shades vary. It’s a case of choosing which colour you prefer and blends into your garden’s landscape. It’s hard to choose a particular shade within this attractive set. These look great! 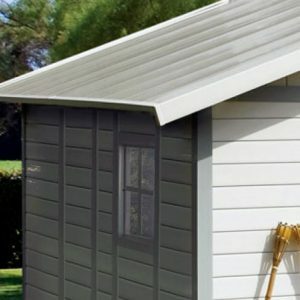 I’m from South Africa and live in a city they have extremely high and powerful winds, With the reinforced roof and the anchor screws these units look like they tick all the boxes when it comes to outdoor sheds. Thanks for calling in and reading about Grosfillex’s PVC garden summerhouses. 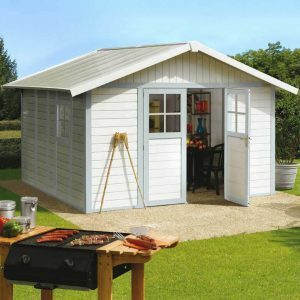 Yeah, these summerhouses are described as strong sheds with a sturdy central steel beam stretching all the way across the roof length’s apex ridge peak to where all the roof panels framework attaches to. This creates a spacious expanse of headroom height due to the absence of a steel truss system stretching out across the internal apex width seen on the majority of competing plastic sheds, but this clever design is just as sturdy yet more homely, designed specifically for summerhouse use. Normally plastic sheds incorporate a translucent skylight strip embedded where Grosfillex’s main roof support is situated. Rather than skylights, Grosfillex install larger windows in the wall and doors to deliver plenty of daylight to the interior. The anchor system is a great design. Secured to each corner post and anchored down into the ground plus the anchor system runs around the shed’s perimeter at various points to which is additionally secured down into the foundations below. Further anchorage can also be added by virtue of the additional anchor kits where steel cables with links and tensioners enhance reinforced support to all corners of the shed. Grosfillex have specifically designed this for exposed areas. Nice blog entry! The article is well written and very informative. The Grosfillex Deco Sheds is definitely one of the amazing things that I have seen on the internet this week! 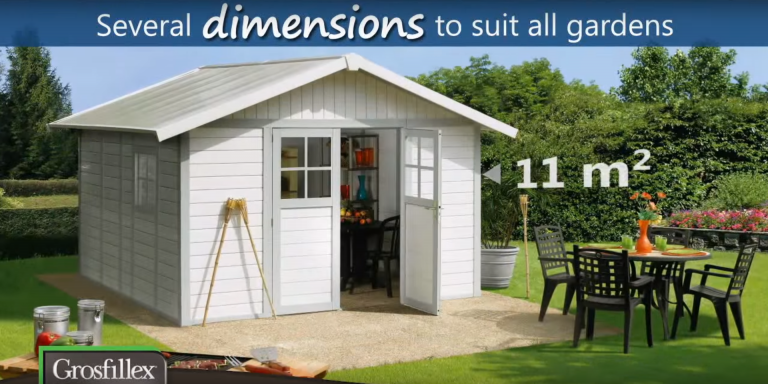 Imagine a maintenance-free shed that can cater to your specific needs. After reading this post, I am now considering building a small shed in my garden. Thanks for dropping by and reading about Grosfillex PVC Garden Summerhouses. Aren’t these Grosfillex sheds the real ticket, apart from a wash down they’re maintenance-free. The reason they are floor-less is for the ability to customise the interior to create your own divine personal space, whether it’s home-office, seating area, games room, kitchen-diner, pool services, art studio or traditional garden or potting shed services, their potential services are immense. Build your own shed, why not. Create your own personal style, a garden room of distinction, an escape route from home-life’s busy surroundings.